Prime Minister Narendra Modi today launched 3 news schemes for Urban Redevelopment. These 3 schemes are AMRUT (Ensure basic infrastructure and sanitation in urban india), Housing for All (Urban) (to ensure every household to be enabled to own house) and 100 Smart Cities Mission (to build 100 Smart Cities in India). To Give 100 Smart Cities all across india, Prime Minister Narendra Modi has launched Smart Cities Mission, Under which 100 cities of India will be developed, Rs.40,000crores to be spend on this mission. To get this mission done, PM Narendra modi has signed many MOU with foreign country's Cities in his first year of governance. Foreign Countries like Japan, UK, China, Australia, United States of America and many more countries to help build Smart Cities. These Smart Cities will have advance and improved infrastructure with smart services to be provided. "What is smart city? Simple. A city that provides more than what a citizen expects. Before he wants it,we provide it", said Prime Minister. These smart cities will be made on new land (near by existing cities, Just like GIFT city of Gandhinagar). Check out Full List of 100 Smart Cities of India here. Check out 12 Advance Features of Smart Cities here. This is another Urban Development scheme launched by Shri Narendra Modi today in which there will be provision to get house for every household by 2022 (when India will complete 75 years of Independence). The mission will be taken up in all the 4041 notified towns across the country. 2 crores house will be built for urban poor with central assistance of 1 lakh to 2.3 lakh rupees. There will promotion of Slum Free Cities (like Gujarat and few other states have) and house will be on the name of women or jointly with husband. This is much needed mission as Indian cities are starving for basic infrastructure. AMRUT Mission's full form is Atal Mission for Rejuvenation and Urban Transformation. (This is 2nd Scheme launched by NDA Govt after Atal Bihari Vajpayee Name,First one was Atal Pension Plan). Under this scheme, Rs 50,000 crore rupees will be allotted to build basic infrastructure in small cities (which have population over 1lac). Government of India to make ensure under Amrut mission that people of small cities must get sanitation, drinking water, solid and waste management and transport. As of now this much available information we got for all three schemes. Soon will add how to get home under Housing for all mission and other information. 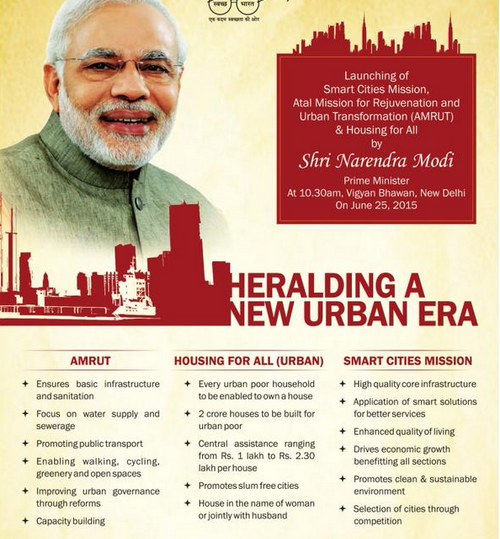 Read Text Version of Narendra Modi's Speech here >> http://www.narendramodi.in/pm-s-remarks-at-the-launch-of-amrut-smart-cities-mission-and-housing-for-all-urban-.